There have been many advancements over the years in the area of skin tightening and body contouring, and recently the Syneron VelaShape II laser machine has taken that to the next level. This system is the first to be cleared by the FDA for non-invasive circumferential reduction, and it is also cleared for cellulite reduction. The Syneron VelaShape II laser systems uses the company’s popular elos technology that combines the best of IPL, laser and radio frequency technologies to achieve tremendous results with less patient discomfort. To get the best price on a pre-owned Syneron VelaShape II laser machine, simply fill out the contact form below. 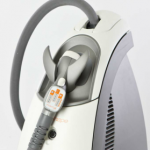 We are happy to help you compare our prices on used cosmetic laser equipment and provide a no obligation price quote on a used Syneron VelaShape II laser system. Not only do we offer some of the lowest prices in the business, but we back them up with a 100% satisfaction guarantee. All it takes is one quick e-mail to SunrayLaser.com to get a low price quote on a Syneron VelaShape II laser machine. There is never any obligation to request pricing details, and we are happy to answer any other questions you might have about our used cosmetic laser equipment inventory.